In day-to-day conversation, a number of terms sometimes lead to confusion, especially when the words involved infer different things in colloquial and professional contexts. "Revenue" and "profit", for example, are often used interchangeably by the average person, but these terms mean different things even if profit is an outcome of revenue. Contextual clarity on terminology is important to avoid confusion of intent or action. Revenue is a synonym for income, whereas profits mean net income. Profits, in simple terms, refer to income or revenue that remains after all expenses. It is in these terms that we should attempt to understand what it will take to meet Prime Minister Modi's target of doubling farmers' income by 2022. Income is the total revenue generated from sales of goods or services. Income is, therefore, the immediate outcome of sales fulfilled. Simply explained, the concept of doubling farmers' income has to first translate into multiplying their sales volume. Most farmers will retort, "Do not teach us how to produce more, first show us the market!" Suppose a farming group is able to sell only 50% of their production capability. 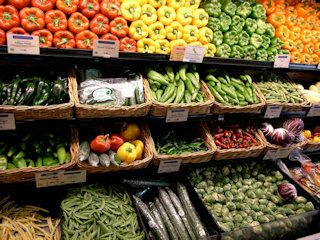 Increasing the quantum of produce or saving input costs will not increase their revenue stream. Farms need to be empowered to reach out to more consumers so that they can scale up their sales. The price point at which sales are transacted as well as the transaction volume directly reflect on the top line, or revenue. The margin between selling price and delivery costs is obviously the profit. The simple-minded lure would be to force an increase of the selling price, but this tactic would interfere with demand-supply dynamics and is not sustainable. We need to take our farming from peasant mode to agri-business mode. This also means our analysis and actions should be in accordance. Price discovery, or the value fixation of a product, is better linked to demand-supply balances, quality and consumer acceptability. 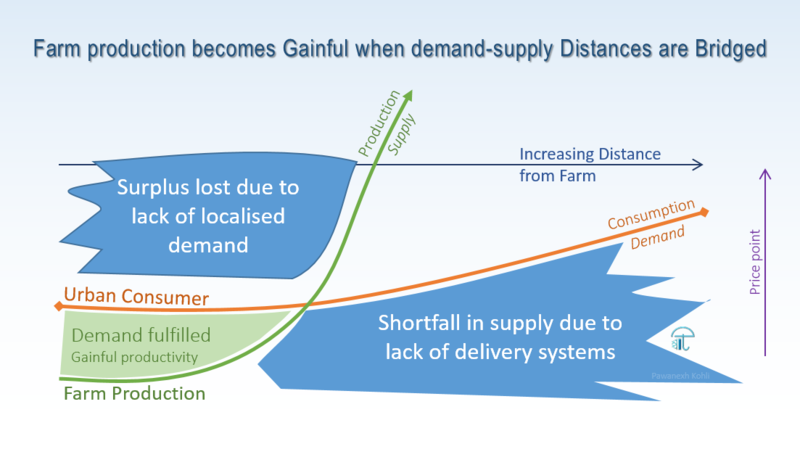 In case of fresh food items, a demand-supply mismatch can also be episodic for various reasons. However, physical delivery remains essential to close any sales transactions and this brings us back to the need for effective farm-to-consumer agri-logistics. Operational excellence helps optimize the inputs for better field-level productivity -- to reduce use of depleting resources, to lower cost of operations, to counter on-farm vagaries, etc. These and other tactical measures help reduce input costs and may add to farm outputs. Lowering of input costs may also make the produce more competitive at a lower price point, and therefore help capture more consumers. Nevertheless, profitability follows revenue generation and revenue multiplication ought to be the primary target. Profit rests on maximizing one's net returns, and a simplistic tactic can lead to artificially timing the markets for the best price per transaction. However, price arbitrage where it exists, attracts opportunists and this in turn is not necessarily sustainable in the long run. Efforts towards achieving more production or productivity must be in tandem with market linkage, or in fact, be secondary to market development. Increasing farm level productivity assures a supply-side surplus, which when not linked with markets results in a fall in price and possibly losses. Strategic thinking cannot remain provincial and market development needs to be more expansive, and at a national level. A case in point is the frequent glut evidenced when farmers produce more of a crop that fetched better margins in a previous year. The higher yield, when finding no new market uptake, creates a market imbalance, price takes a downwards trend and good food is left on the wayside to rot. Luckily in case of food, all else being equal, demand is almost eternal. The bottleneck is in reaching that demand. In fact, most farmers will retort, "Do not teach us how to produce more, first show us the market!" Effective logistics networks and supply chains, by taking produce to multiple markets, will ensure surplus production meets that eternal demand. Building the ability to reach more mouths, more consumers, is key to multiplying farmers' revenue. All other options that target the reducing of input costs are secondary and will merely add a few percentile points to their net income. While the government procures cereals and builds a buffer for strategic reasons, the high-value produce is subject to availability of market linkages. The successful implementation of logistics links is evidenced in our phenomenal success with milk and needs to be replicated across other food items. The immediate action needed is to enhance all forms of market links, with the main focus being on closing the gaps in all physical modes of delivery. Logistics networks serve to smartly bridge demand with supply, help farmers achieve gainful productivity and make agriculture sustainable. We need to take our farming from peasant mode to agri-business mode. This also means our analysis and actions should be in accordance. Strategic thinking cannot remain provincial and market development needs to be more expansive, and at a national level.